Google Play Offering 4K Movies At As Low As $19.99, Apple TV 4K Effect? 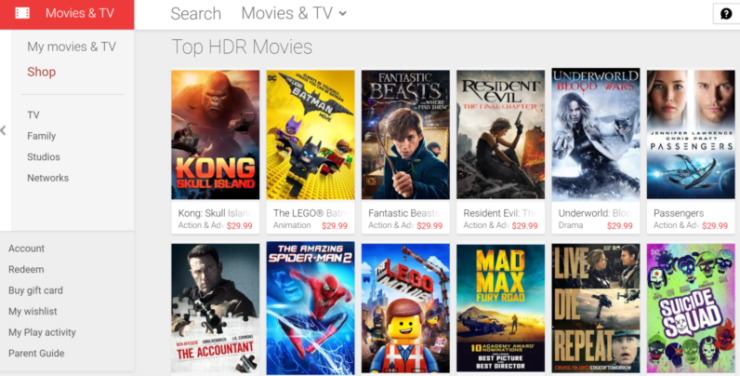 Google seems to be taking competition with Apple pretty seriously, which is why it has lowered its pricing for 4K HDR content on Google Play Movies. As you know, earlier this month, Apple announced Apple TV with 4K HDR capability at lesser pricing. But this is just the beginning of 4K HDR content on Play Movies, and only a few movies are available in the HDR format. 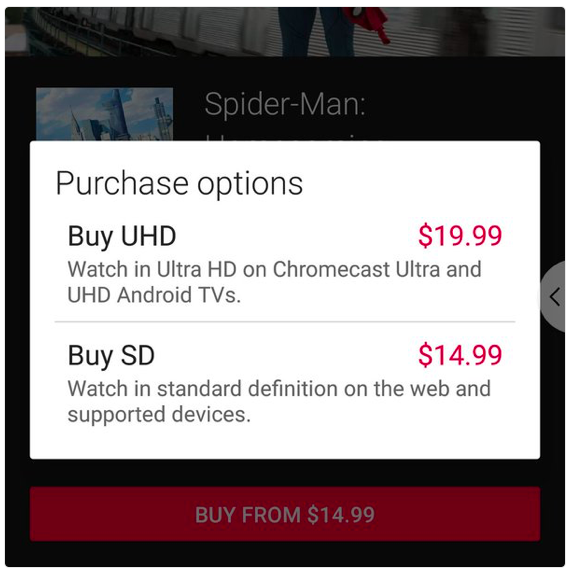 One of the movies on offer is Spider-Man: Homecoming that is also available on Apple TV and VUDU, at the pricing of standard HD content. Sony Pictures has partnered with both Apple and Google Play Movies. Other movies in Google’s catalogue are Passengers and Baby Driver, listed at $19.99 for the UHD versions. However, these are just a few movies at that pricing, other movies from Sony and other studios like 20th Century Fox, Lionsgate, Paramount, and Universal, are listed at up to $29.99 for UHD versions. For example, Warner Brothers’ Wonder Woman is listed at $29.99. After seeing the listings, it looks like Sony and Google are testing users’ response for 4K video content on Play Movies and VUDU. Maybe, they will bring more content at standard pricing if the user response is encouraging. Or maybe studios are going to overhaul their pricing for 4K content across all the platforms. Also, Google is not the only one following Apple TV 4K in listing UHD movies for as low as $19.99. Just yesterday, Amazon also dropped the pricing to $19.99, and some titles were available for as little as $5. We will keep track of Google Play Movies for the next few weeks to see how it continues to adjust its pricing as Apple TV 4K is nearing its launch. Until then, maybe you can try watching Spider-Man Homecoming in 4K. We should be thanking Apple for starting the trend, as now other services are taking the same route. It will be interesting to see if 4K content is made available at even cheaper rates in the coming weeks. Stay tuned with us to know more about it.